ICEBLOG: Tuesday, 30. May. A beautiful summerday. Tuesday, 30. May. A beautiful summerday. The weather has been fantastic today and we have done a lot. We have even had time to enjoy an outdoor lunch. Lars have put up the last measurement points for the surface motion of the glacier. Dennis and Claude have measured quite a few radar profiles. They only lack a few hours of measurements until they have completed this part of their work. 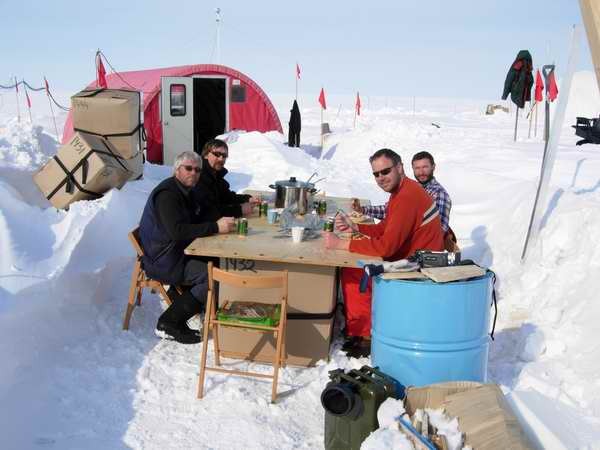 The drillers Steffen and Sverrir have worked in the drill tent in order to keep Andreas, Bruce and Jørgen Peder busy with the ice core processing and analysis. 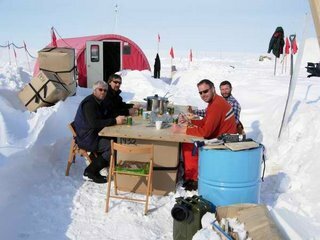 Simon made food and cleaned up in camp. Today it was sunshine and clear skies. We could see the mountains in the far southwest, and towards southeast we could see the sea in the Fram Strait (the sea between Svalbard and Greenland). There was no wind and the temperature at 13.00 was 0 degrees C and at 21.00 -4.3 C.
In total we have drilled more than 22 m of ice. The core is alternating between light (white) layers with compressed snow that never has been melted and dark (clear) layers of refrozen wet snow. The layers of refrozen wet snow varies a lot. Some are only a few cm thick and others are several meters thick. It seems like Flade Isblink experiences very different weather conditions during the summer. Some years the melting is so strong that the whole glacier becomes wet during summer, other years the glacier is as cold as the Greenland ice sheet itself, which is 200 km to the southwest. Here at Flade Isblink the contrasts meet, which we have experienced ourselves during the last weeks' dramatic weather changes. We have been in touch with Copenhagen and VECO over the Iridium phone today. I wish I was there!! It looks just like home (at Law Dome!) snow everywhere - blizzards and drifts causing chaos! Ahhhh the price for a high accumulation record!! I was very impressed to hear that you can see the Mountains and the Ocean - pretty cool! Hello to all and I'll keep an eye on the blog! Sunday, 21. May, can it still get worse?